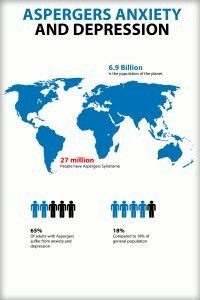 Anxiety poses one of the core challenges for people with Asperger’s Syndrome and other types of autism. There is a great deal of anxiety already inherent in the condition itself, which is then further intensified by social pressure and hypersensitivity to outside stimuli, another common symptom of autism. People suffering from panic disorder can experience sudden and repeated attacks of fear. The person senses that impending disaster is close by and that they will lose control of the situation. It can result in shortness of breath, hear palpitations, chest pain, hot flushes or light headidness. Social phobia is a fear of being judged by others. It often represents itself by excessive self consciousness and anxiety in every day sitatuations. Its also possible that it triggers off panic attacks that are associated with panic disorder. Often this fear makes us withdraw from society, being afraid to go out. GAD represents itself in the form of worrying excessively. It may be combined with symptoms such as headaches or insomnia. This form of anxiety represents in the need to check things repeatedly and unnecessarily, such as checking the door is locked or one has washed their hands. Often the presence of anxiety in people with Asperger’s is overlooked because one’s internal state or mental setting is hard to communicate and explain to non-autists. But living with anxiety can affect body image, motivation, behavior, and even the ability to think correctly. Anxiety has long been known as the main cause of so called brain fog, a condition where one feels as if thoughts are obscured by cotton wool. A heavily crowded classroom for example, might result in worse grades on an exam due to social anxiety alone. While certain autistic individuals may be very high functioning, if they have anxiety it can go as far as to make them feel or act as if they are not. A common approach to this problem is withdrawal from whatever causes said anxiety. Yet obviously this is not a solution. It’s irresponsible to isolate oneself as a response to the outside world, and it may ultimately prove counterproductive since it leads to more severe anxiety in the long run. If the anxiety is moderate to severe, it should be the primary focus for treatment. While many search for a cure all pill, it is important that this issue is dealt with in more ways than at a purely pharmaceutical level. While medication makes up a significant part of a successful treatment plan, the mindset itself has to be remedied before lasting improvement can be noted. Do not just see medication as an easy way out, it is merely a tool to assist you in self improvement. Autism related anxiety is typically characterized by depression, overwhelming discomfort around people, heart palpitations, profuse sweating, mutism or pressured speech, obsessive and repetitive thoughts, and an overwhelming desire to escape the current surroundings. Firstly paying attention to, and becoming aware of these symptoms already leads to a noticeable improvement. If it is appropriate to the given situation, listening to downtempo (chill) music greatly alleviates anxiety. If you are experiencing intrusive thoughts, imagine them floating away beyond the top of your head. After a while, they will slow down or cease. Try to inhale slowly through your nose, and exhale slowly through your mouth. In severe cases of anxiety: breathe in, hold for 8-10 seconds, breathe out. Repeat this until you feel better. Eventually your body and your unconscious mind will get used to doing this, and automatically adapt your breathing pattern. If you are looking for more techniques in dealing with day to day anxiety, we cover the issue in more depth the issues surrounding Anxiety in our book emotional mastery for adults with Aspergers. Please tell us what your experience with anxiety is by leaving us a comment below. I am having really severe anxiety. It is so bad that it is scary. i am an adult, 77 years old. I don’t know how to handle this. i have an appt. with a psychologist in a couple of days. I suppose that I may be prescribed something for anxiety. I hope I can get help for this because it is incredibly bad. I feel helpless and alone. I have high functioning Autistic Spectrum Disorder; I don’t know if I have Asperger’s or not. I am not sure of the difference. I only realized that I have this condition two years ago. I believe that my siblings also have it in varying degrees. I don’t want to have it but I do. I am having a very difficult time accepting it. I feel that there is not much help out there in the world for people like me. I question the use of the word “irresponsible” to withdraw from the world! For a lot of us, this is a rational way of dealing with and surviving our difficult lives. Makes no sense to me and that ruined what was otherwise a helpful article. i have Aspergers, OCD and lifelong problems with eating disorders. Anxiety to maximum levels and depression that won’t shift. This had gone on my whole life. I’m 44 now, and living in Japan. I’m somewhat agoraphobic and the truth is I totally don’t know what to do to help myself. out around people when it’s absolutely necessary! Any refs for the numbers used on the graphic? It’s really interesting and I’d like to share it but need references! I recently read about anxiety not being a feature of Aspg’s on a psychology site. The author said that anxiety indicated non-Asperger’s/’social phobia’ because they are not aware of how they don’t fit in, and therefore don’t experience social anxiety. I was worried by this as it implied that ‘social phobia’ is therefore a non-aspie trait. I am glad that you have published this article. The implication by that author that one is not aware that one is somewhat different and doesn’t fit in at all seems absurd to me. I can get “brain fog” by there just being one person around, let alone a crowd. Anxiety might be part of being Aspien through experience which adds to inborn fears. Some weird nightmares in my childhood may still have been tolerable, but with every failure within the process of socialisation, my anxiety increased. Even now as a mature person, I don’t have a solution, though the advice in this article seems to be good and very helpful to overcome moments of panic. There seem to be different kinds of anxiety with different needs and solutions. My son is 13 and suffers from a few anxiety issues. He has the social phobia, GAD, and OCD. His OCD, which I find the most interesting is that he has to go from room to room repeatedly and touch each animal and person in the house. He does this countless times every day. This is just one of HIS things and doesn’t bother us. He loves to go through and hug or pat over and over like he is taking a count.